This article is about the event. For the book, see The Battle of Red Mountain. At the start of the war, Dwemeri forces were concentrated in the northwest of the province, and their campaign initially had great success throughout the north. In northern Vvardenfell, The Dwarven fortifications of Bthungthumz served as a massive processing facility for Dwarven Centurions and colossi. There's speculation that many of the great metal automatons the Dwemer used as troops in the battle were built in the Great Workshops of Nchardak on the island of Solstheim. The coastal Dwemeri city was reputedly able to produce one automaton a day, an apparently impressive rate of production. Many westerners were at the battle, notably Orcs and Nords, and sources often designate them as allies of the Dwemer. Dagoth Ur was presumed to have died (except in Ashlander stories) until nearly the beginning of the Third Era. Nerevar's lieutenants Vivec, Almalexia, and Sotha Sil rose to power among the Chimer. Within a few years, they would successfully use Kagrenac's Tools to become living gods, leading the Chimer to transform into the Dunmer. They manipulated preexisting ancestral and Daedra worship into the Tribunal Temple dedicated to their worship, and concealed the truth of how they gained their divinity. House Dagoth was branded as a nest of traitors, and its members were killed or incorporated into other houses. 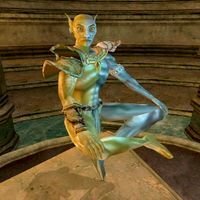 With the Dwemer gone, the Dunmer laid claim to all of modern-day Morrowind and their divine protectors kept them autonomous and relatively happy for millennia. The Heart of Lorkhan remained in the mountain, and the Tribunal would return to it annually to refresh their energy. The Ashlanders, who refused to accept the Tribunal, returned to the ash wastes, where they passed down very different accounts of the battle and its villains. Red Mountain erupted around this time (the year of Sun's Death, the first eruption of the mountain, occurred in 1E 668), though it's not clear if this was just before, during, or soon after the battle. ^ The inference that there was a Battle of Red Mountain in 1E 416, preceding the 1E 700 battle, is based on reading Five Songs of King Wulfharth in harmony with the other sources provided. Among other contextual clues, parts of Five Songs take place circa 1E 500, but mention the Greybeards and High Hrothgar. If Jurgen Windcaller did not form the Greybeards until after the 1E 700 battle, this would not appear to comport with the historical narrative established by the other sources. However, this may not be reliable due to the apocryphal nature of Five Songs, and the potential ramifications of a Dragon Break surrounding the battle. 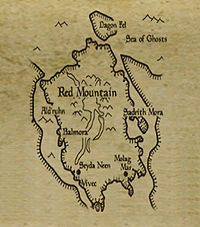 In a 2005 interview, Douglas Goodall stated that during the development of Morrowind there was no "official" account of what happened at the Battle of Red Mountain. "When I was at Bethesda, there was officially no answer. No one knew what really happened. They may have made up their minds now, but you'd have to ask a current employee." This page was last modified on 29 January 2019, at 04:05.